Chirality is a fundamental, persistent, but often overlooked feature of all living organisms on the molecular level as well as on the macroscopic scale. The high degree of preference for only one of two possible mirror image forms in Nature, often called biological homochirality is a puzzling, and not yet fully understood, phenomenon. This book covers biological homochirality from an interdisciplinary approach - contributions range from synthetic chemists, theoretical topologists and physicists, from palaeontologists and biologists to space scientists and representatives of the pharmaceutical and materials industries. 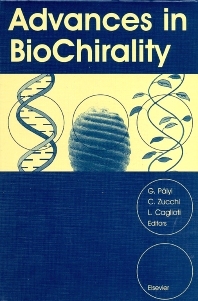 Topics covered include - theory of biochirality, origins of biochirality, autocatalysis with amplification of chirality, macroscopic (present) biochirality, fossil records of chiral organisms - paleochirality, extraterrestrial origin of chirality, exceptions to the rule of biological homochirality, D-amino acids, chemical transfer of chirality, PV effects, and polarised radiation chemistry. Chapter headings: Preface. (C. Bartolacelli). Dimensions of Biological Homochirality (G. Pályi et al.). Chirality Algebra and the Right-left Classification Problem (R.B. King). Theory of Biological Homochirality: Chirality, Symmetry Deficiency, and Electron-cloud Holography in the Shape Analysis of Biomolecules (P.G. Mezey). On the Biological Advantage of Chirality (G. Gilat). Origin of Biological Homochirality: Directed Selection or Random Motion? (V.A. Avetisov). Possible Mechanisms for Spontaneous Production of Enantiomeric Excess (D.Z. Lippmann, J. Dix). Search for the Origin of Homochirality of Biomolecules (L. Keszthelyi).The Role of Homochirality in Evolution (Z. Nansheng). A New Method for Testing Molecules of Prebiotic Peptide Assembly (M. Bengtson, E. Edstrom). Asymmetric Autocatalysis and Biomolecular Chirality (K. Soai, T. Shibata). Left-right Asymmetry in Animal Embryogenesis (M. Levin). Evolutionary Origin of Asymmetry in Early Metazoans (J. Dzik). Chirality in Charophytes: Stability and Evolution from 400 million Years to Present (I. Soulié-Märsche). Application of Amino Acid Racemization in Fossil Pleistocene Vertebrate and Invertebrate Analysis. Preservation of Proteins and Amino Acids (T. de Torres). Biomarker Reaction Kinetics during Kerogen Microscale Pyrolysis (G.D. Abbott, A.W. Scott). Aspartic Acid Racemization in the Dentine of Bears. Tooth Dentine Amino Acids versus Mollusca Amino Acids (T. de Torres et al.). The Abiotic Generation of Homochirality on Saturn's moon Titan (J.I. Lunine et al.). D-Amino Acids in Nature (Y. Nagata). Racemization-induced Defolding and Aggregation of Segments of &bgr;-Amyloid Protein: An Early Step in the Formation of Amyloid Plaques (Zs. Majer et al.) Occurrence and Biosynthesis of Animal Peptides Containing a D-Amino Acid (G. Kreil). Spontaneous D-Aspartic Acid Formation at Specific Sites of Lens Protein During Aging (N. Fujii et al.) Asymmetric Phenomena in Studies of Encapsulation and Assembly (J. Rebek Jr.). Self-assembly of Cholesteric Liquid Crystal Polyesters and their Stereoselective Interaction with Liposomes of DMPC (M. Pérez-Mendez et al.). Transferring Chirality in Homogeneous Catalysis (P.S. Pregosin). Chiral Genetics of Drugs and Related Compounds (B. Nosál). Chiroptical Properties of (S)-(—) Methyl Glycolate-d1 (A. Forni et al.) Experimental Evidences for Parity Violating Energy Differences between Enantiomers (A. Szabó-Nagy, L. Keszthelyi). On the Stabilization of Natural L-&agr;-amino Acids and D-Sugars via Parity-violating Effects (R. Zanasi et al.). Radiodecomposition of D,L-aspartic Acid by Tritium-&bgr;-rays (M. Akaboshi et al.). Index. Dr. Pályi is a Professor (Retired) of Chemistry of the University of Modena and Reggio Emilia (Modena, Italy) and member of the (Italian) National Academy of Science as well as other Academies. He has authored and edited 5 books on chemistry, patents, and 250 publications cited more than 2000 times by other authors. He has been the chief organizer of the International Symposia on Biological Chirality (since 1998) and of the International Symposia on the Soai Reaction (since 2008).